Okay, so maybe I was wrong. It is getting cooler. Kinda. Sorta. I mean, it was in the 70s over the weekend. Which, after a summer of 100+, feels downright cold. So on Sunday afternoon, with the cooler weather and a long-overdue Longhorn win, I was in the mood to make beef stew. Only problem? Sunday evening is our date night. Meaning, I couldn’t be hovering around the oven when the dish would be done. So I decided to make my usual recipe with a few changes: (1) put it in the crock pot instead of the oven, (2) reduce the red wine to deepen the flavor, and (3) swap the fresh thyme with rosemary (it was all I had). OMG, I couldn’t believe it . . . the result was even easier and delicious-er than before!!! The rosemary added a wonderful herbal, almost sweet, flavor to the dish. And the crock pot was, as always, a dream. As far as serving, we love it over over buttery egg noodles with a sprinkle of parmesan and freshly cracked pepper. If you prefer something more low-carb, try it alongside gluten-free and paleo-friendly spaghetti squash or pureed cauliflower. Then just add a glass of red wine, and you’re all set to tuck into little slice of heaven. Heat the oil in a large Dutch Oven over medium heat. Add the beef. Brown the beef in the hot oil. (Be sure to brown the beef in small batches, about 1/2 lb. at a time. If you add much more, the beef will steam and lose flavor.) Transfer browned beef to crock pot. Add red wine to the Dutch Oven. Using a spatula, scrape up any brown bits left from the beef. Reduce the red wine by half, stirring occasionally. Add butter and sugar, and swirl to combine. Pour the red wine and butter mixture over the beef. Add the carrots, onion, garlic, bay leaves, Worcestershire sauce, beef broth and mushrooms to the crock pot. Season with salt and pepper. Cook stew on low for 8 hours. Taste; adjust seasonings as desired. Serve finished stew as is, or over buttered noodles, or alongside spaghetti squash or pureed cauliflower. Hi Marie! We tried this out recently, but the beef turned out really dry for me. I browned one half pound at a time. I followed the directions closely and cooked in the crock pot on low for 8 hours. Any idea what I could’ve done wrong? Thanks! Loving trying out your recipes. Hi RJ! I’m so glad you posted this comment! 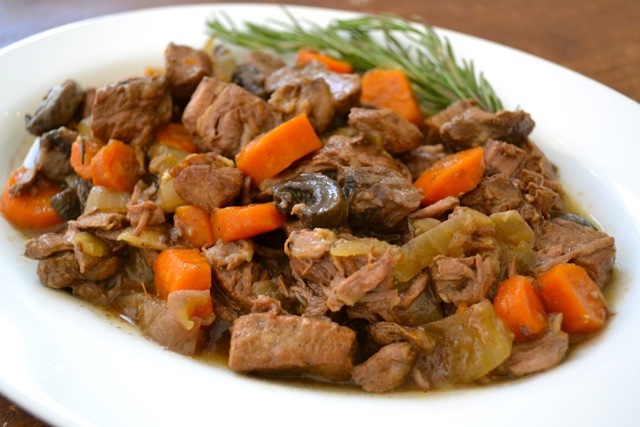 I’ve been meaning to share a slight revision to the beef stew recipe that uses a big ‘ol chuck roast instead of those little pieces of lean stew meat. Now I have a reason to post it ASAP! 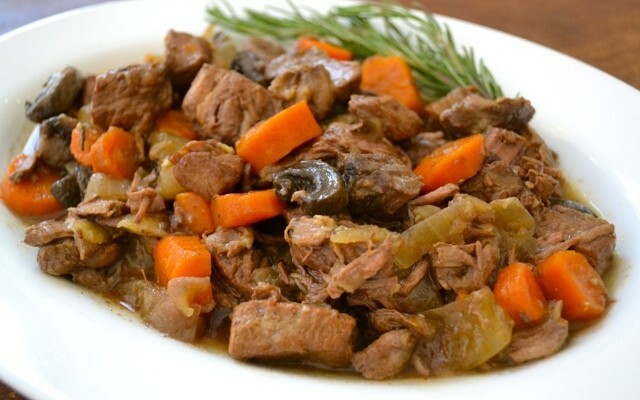 The problem with lean stew meat is that it is exactly that — lean stew meat :) And so even when you slow-cook it just right, it ends up being sort of tough and dry. A chuck roast has much more flavor and character (fat!) and won’t dry out. So if you’re willing to try the recipe again, I recommend a 2 lb. grass-fed beef chuck roast, seared in a hot pan first and then put in the crock-pot, with everything else the same.